Expressions are combinations of variables, literals, operators, or functions that can be evaluated to produce a result. Expressions simplify to a single value. Operators are special symbols to perform mathematical functions, comparisons, and assignments. Most mathematical operators are exactly the same as they are in math! For example: +, -, / and * for addition, subtraction, division and multiplication. However there are a few you may not be as familiar with. To raise a number to a power we use the double star (**). In the example above x would evaluate to 9. Another less familiar operator is the modulus (%). The modulus divides one number by another and tells us the remainder. In the example above x would evaluate to 1, since two can go into three once, leaving a remainder of one. For assigning variables, use the = operator, and the + for string concatenation. In the above example we use the = operator to assign the variables firstName, lastName, and name values and use the + operator to concatenate firstName and lastName. Feeling nostalgic for those 5th grade math classes? Well then Christmas has come early... PEMDAS is back! IMPORTANT NOTE ABOUT COMP110: We assume that you have a solid foundation in algebraic problem solving! If you are concerned about your understanding of algebraic concepts, check out some Khan Academy tutorials or use the Message My Team function and reach out to your TAs about your concerns! ending with addition and subtraction from left to right, 4 + 30 - 4 = 30. Booleans are either true or false, but we can also have expressions that are true or false. This means we can have whole expressions which are actually just booleans? What is this sorcery?! Actually it's quite simple, and unfortunately involves no sorcery at all; they're called conditional operators. There are several operators that help compare data, and we'll discuss them below. "Is the number on the left of the > larger than the one on the right?" "Is the number on the left of the < smaller than the one on the right?" "Is the number on the left of the >= greater than or equal to the one on the right?" "Is the number on the left of the <= less than or equal to the one on the right? Now that's all well and good, but let's look at them in some code! There are two special operators that are especially useful when writing loops. These are the ++ and -- operators. The ++ operator is used to add 1 to a number variable, and the -- subtracts one from a number variable. This is the equal to operator. It has THREE equals symbols in a row. This is the not equal to operator. It uses the ! symbol to mean "NOT." It is the ! symbol followed by TWO equals symbols. Logical operators and negation are useful for creating compound logical statements. Using the AND operator with boolean expressions results in true only if both expressions are true. 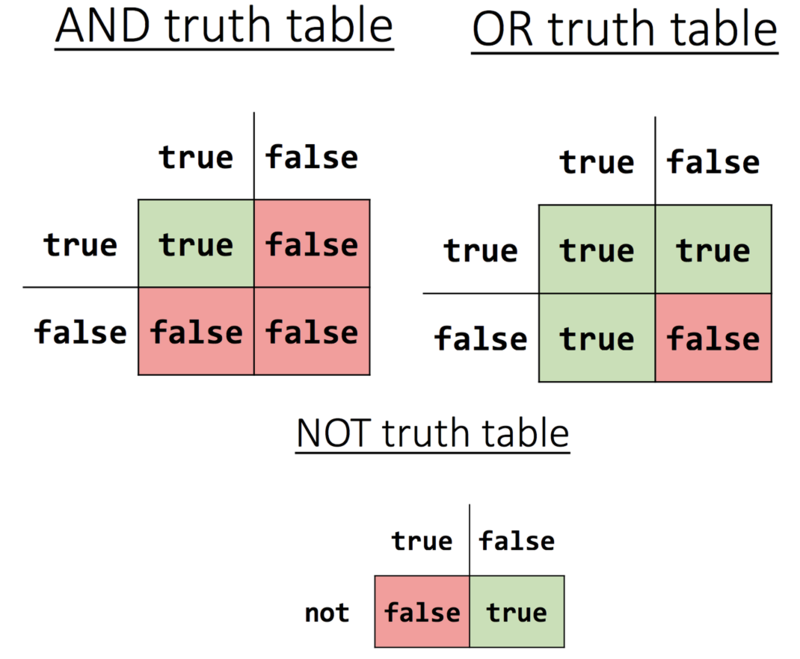 Using the OR operator with boolean expressions results in true if either expression is true or if both expressions are true. This operator gives us the flipped meaning of a boolean - so if something normally evaluates to true, prefacing it with the ! operator will result in a false value, and if something is normally false, using the ! operator will result in true. Here are some examples putting everything we've learned together! Modifying the value stored in a variable, then storing the modified version back in the variable is pretty common, so there are operators designed to make this easier for us! str += num; // str is now "comp110"